Here comes Saturday Night Live on Sept. 13th with the first show of its 34th season. The host is Olympic swimming god Michael Phelps, with musical guest Lil Wayne. As always, though, it'll be SNL's latest regular cast members trying to make him look good while also vying to become big or bigger stars themselves. So who are the show's all-time stalwarts? This is a very tough list to winnow down. And it has nothing to do with how successful you've been on the big-screen. Otherwise Robert Downey Jr. would make this cut, even though few remember his lone 1985-'86 season with SNL. It just goes to show that you can have a great college career without necessarily excelling beyond that. These are the Top 10 indispensable SNL stars who kept putting the show on the map. 10. Tina Fey (1997-2006) -- An ace writer as well as SNL's best-ever Weekend Update anchor, she sold herself as a plain Jane but looked smashing doing so. Totally unaffected when it came to letting her hair down to sell a joke. And no two SNL women have paired up better over the years than Fey and Amy Poehler. 9. Chevy Chase (1975-'76) -- No one in the cast seemed to like him very much, and his ego demanded that he leave after just one season to hit the big-screen running. But the first Update anchor also was SNL's inaugural leading man, whether reading fake news or pratfalling as Jerry Ford. "I'm Chevy Chase and you're not." He fully believed this, and took it to the bank. 8. Dan Aykroyd (1975-'79) -- Chase's early departure left him as the glue, not only as a Blues Brother but behind the scenes and in a wide variety of sketches in which he regularly played smarmy salesmen. Not everyone could get away with caricaturing Richard Nixon with a mustache. But Aykroyd did it, and also pulled off a sillified Jimmy Carter. Add a "wild and crazy" Festrunk brother, in partnership with Steve Martin, and you've got a body of work that's never quit. 7. Eddie Murphy (1981-'84) -- Garrett Morris was SNL's charter minority cast member, but Murphy became the first person of color to steal the show and make it his own during the otherwise mostly dismal early 1980s. All seven of the original "Not Ready For Prime Time Players" were gone by then, and SNL might not have gone on at all without Murphy and some decent wingman work by Joe Piscopo. Murphy's Gumby, Mr. Robinson and Buh'wheat characters became his signatures. Otherwise what else was there? In those years, not very much. 6. Bill Murray (1977-'80) -- Brought in to fill the void left by Chase, he quickly made most fans wonder why he hadn't been there in the first place. His lounge singer routines were crackups then and now. And he was a perfect, doofus partner for Gilda Radner in their recurring portrayals of Lisa Loopner and "noogy"-dispensing Todd diLamuca. Murray also teamed effectively with Jane Curtin as part of Update's first co-ed anchor team. 5. 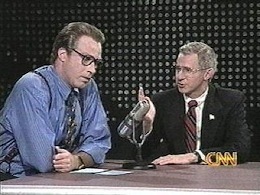 Will Ferrell (1995-2002) -- Excelled as a language-mangling, dense George W. "Strategery" Bush, but also scored with impressions of James Lipton, Alex Trebek and Harry Caray. Several of his original characters also lived long and mostly prospered, even if the initially clever "Spartan Spirit" sketches with Cheri Oteri began to grate. Ferrell was willing to bare any allowable body part and bear up under any indignity if it paid off with a big laugh. Far more often than not, it did. 4. Phil Hartman (1986--94) -- The ultimate utility player, whether impersonating the likes of Ed McMahon, Ronald Reagan, Phil Donahue and Bill Clinton or crafting characters such as Unfrozen Caveman Lawyer or innumerable phony baloney pitchmen. Hartman was never funnier than on the night he over-ate as Clinton at a McDonald's, stuffing his face to the point where he couldn't get his lines out. A great talent whose life tragically ended at gunpoint. 3. 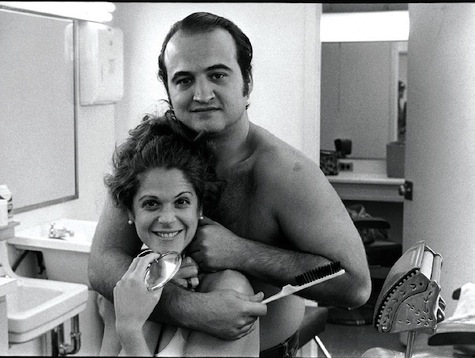 Gilda Radner (1975-80) -- Rosanne Rosanna-Dana. Emily Litella. Baba Wawa. Those three characters alone easily made her SNL's first breakout woman star on a show that's more often than not been too much of an insular man's world. Radner soared on the strength of her comic ingenuity, using her malleable Martha Raye-esque mug to optimum effect. Viewers also saw her as an approachable sweetheart of a person. No female cast member has since come close to matching her impact. 2. John Belushi (1975-'79) -- He epitomized the vintage reckless, renegade years of SNL, all too well as it turned out. Belushi had huge appetites in almost every way. Some were destructive, others fueled his balls-out physical comedy. He was the cartwheeling Blues Brother, the slice 'n' dice Samurai warrior, the "No Coke, Pepsi . . . cheeseburger, cheeseburger, cheeseburger" counterman, the manic Joe Cocker impressionist. There also was the night he seemed to nearly choke to death as a corpulent Liz Taylor gnawing on a chicken leg. Anything for a laugh. Chevy Chase may have been the matinee idol of SNL's first year, but Belushi has always been its sweat-and-blood Mugsy. 1. 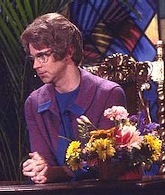 Dana Carvey (1986-93) -- The Church Lady. Garth Algar from the Wayne's World sketches with Mike Myers. The first President Bush. Would-be president Ross Perot, whom Carvey absolutely nailed. He also teamed with Kevin Nealon in the "Pumping Up with Hanz & Franz" bits. And he was hysterical as a mohawked amalgam of Johnny Carson and Arsenio Hall on "The Carsenio Show." Carvey has never really made it as a movie star, but was SNL's all-time king of the go-to guys. An imp capable of mimicking anyone, he also had a mind that could create the likes of partygoing "Massive Head Wound Harry." Party on.